^ 1.0 1.1 Eddington, A. S. Sir Frank Watson Dyson. 1868–1939. Obituary Notices of Fellows of the Royal Society. 1940, 3 (8): 159–126. doi:10.1098/rsbm.1940.0015. ^ BIOGRAPHICAL INDEX OF FORMER FELLOWS OF THE ROYAL SOCIETY OF EDINBURGH 1783 – 2002 (PDF). The Royal Society of Edinburgh. July 2006. ISBN 0 902 198 84 X. ^ Dyson, Frank Watson (DY886FW). A Cambridge Alumni Database. University of Cambridge. ^ Jackson, John. Frank Watson Dyson. Monthly Notices of the Royal Astronomical Society (Royal Astronomical Society). 1940, 100 (4): 238–246 [16 January 2017]. Bibcode:1940MNRAS.100Q.238..
^ 5.0 5.1 5.2 5.3 Spencer Jones, Harold. Obituary: Sir Frank Watson Dyson. The Observatory. 1939, 62 (782): 179–187 [16 January 2017]. Bibcode:1939Obs....62..179S. ^ Aitken, Robert Grant. Sir Frank Watson Dyson, 1868–1939. Publications of the Astronomical Society of the Pacific (Astronomical Society of the Pacific). 1939, 51: 336–338 [16 January 2017]. Bibcode:1939PASP...51..336A. ^ Wilson, Margaret. Ninth Astronomer Royal: The Life of Frank Watson Dyson. Cambrdge, England: W. Heffer & Sons Ltd. 1951. ^ Joint Eclipse Meeting of the Royal Society and the Royal Astronomical Society. The Observatory: A Monthly Review of Astronomy. November 1919, 42 (545): 389–398. 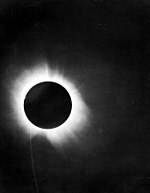 Bibcode:1919Obs....42..389..
^ Dyson, F. W.; Eddington, A. S.; Davidson, C. A Determination of the Deflection of Light by the Sun's Gravitational Field, from Observations Made at the Total Eclipse of May 29, 1919. Philosophical Transactions of the Royal Society A: Mathematical, Physical and Engineering Sciences. 1920, 220 (571–581): 291. Bibcode:1920RSPTA.220..291D. doi:10.1098/rsta.1920.0009.